Skan Holz is an expert company for construction sets for house and garden. For more than 25 years they provide easy to mount carports and terrace covers and wooden houses. 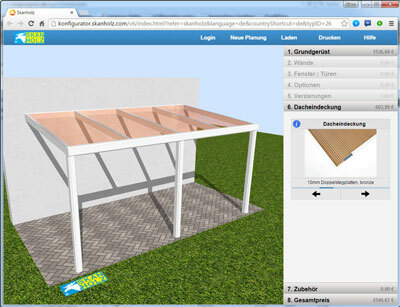 Since many years Online-Planers based on o2c are used for Configurators. With the latest Online-Tool o2c and Skanholz give an idea of the future 3D-Internet-Technology, because the Configurator does not need a Plugin or the o2c-Cloud-Server. The 3D-Presentation bases on WebGL and HTML5 and will be available in future for normal o2c-Objects platformindependent as well.